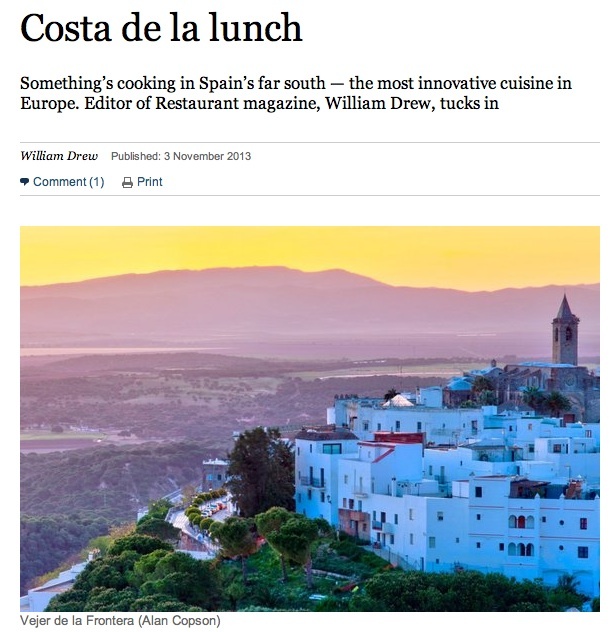 This summer William Drew editor of the world famous ‘Restaurant’ magazine came to Vejer to write an article for the UK’s leading weekend paper the Sunday Times. While successfully flogging the Mediterraneans Costa del Sol, Blanca and Brava to Brits and Germans in their drunken droves, well-heeled españoles have kept a unique stretch of Atlantic coastline, in the country´s extreme southwest corner, largely to themselves. Running west from Tarifa to the ancient port of Cadiz and beyond, the Costa de la Luz is littered with highly individual beaches (facing southwest for optimum sun worship). Relatively undeveloped, the area has for some time attracted the country´s cultural elite, who share it only with the tousled dudes and dudettes who flock Tarifa for kite and windsurfing. Yet now – perhaps in reaction to la crisis, as the Spanish invariable refer to their country´s dire economic situation – it is beginning to develop international appeal, largely by raising its gastronomic game. The result is the combination of world beating beaches and one of the finest and more varied collections of restaurants on the Iberian Peninsula. Despite sitting a few miles inland, the cultural, geographical and culinary centre of the region is the hilltop town of Vejer de la Frontera. In the Moorish old town, you can feast on tostadas, tortas and tapas for next to nothing. Roam the narrow cobbled streets, with their whitewashed walls, and you´ll stumble upon simple but soulfull bars and restaurants at every turn. Among the best are Viña y Mar ( Nuestra Sra. de La Oliva 8; 0034 956 455167 ), which offers superb wines and sherries, as well as excellent simple plates (from £8), and Casa Varo (Nuestra Sra. de la Oliva 9 ; 956 447734 ), where classic tapas are served on tables in the street ( from £6.40 a dish ). For a more elongated eating experience, head to the Corredera-a wide terrace of a street that sits under the ancient town walls, with 180-degree views over the countryside. A few years ago, it was largely empty of restaurants, but now there´s enough variety to satisfy even the most voracious glutton. First among equals is the unassuming but highly original Los Quatro Gatos (650 987 686, losquatrogatos.com ). Don´t be put off by the narrow entrance and minimal number of tables outside; take that as a sign of quality. Inspired, playful bistro dished created by the French chef-owner include cod brandade “shots”, oxtail risotto and squid teriyaki with avocado mousse (shot £2.70, mains from £10.70 ). New kid on the corredera block is Las Delicias ( 956 45 18 07, lasdeliciasvejer.com; small plate for £3.40 ), which opened in the spring this year. Located in a former theatre, it should visited for its modernist style-clash interior alone – it was designed by the person who does the window displays for the retail giant Zara. Farther down the street sits the reliable Califa Tapas, and round the corner, on Plaza de España, you´ll find its sister restaurant, El Jardin del Califa (956 44 77 30, jardin.lacasadelcalifa.com; mains from £10.70 ). In contrast to the recent explosion of new attractions, El Jardin has been serving its Moroccan-led menu for more than a decade. As the menu suggests, the restaurant is set in the charming walled garden of the cavernous Califa hotel, overseen by the Scottish-born hotelier James Stuart. Initially drawn to the area by its watersports, he is an original member of a still small but expanding crop of cultured and colourful international characters who populate the town and its surrounds. Down the hill in the tranquil hamlet of Patria hides Restaurante Patria (956 448463, restaurantepatria.com; mains from £10.30 ). Here, a Danish couple, Ase and Thomas Donso, preside over high-quality contemporary European fare, served on a spacious veranda that effectively doubles as a viewing platform for stunning sunsets. DRAG YOURSELF from town to the beach – which you should do- and the eating doesn´t stop. In summer, chiringuitos, temporary bar-restaurants, pop up on every playa. For something less fleeting, make for the rough-edged fishing port of Barbate- famous for the ancient (and sustainable) fishing method called almadraba. It involves intercepting the prized Bluefin tuna (Barbate is home to what may be the world´s only tune museum ) as the fish make their way from the Atlantic to the Mediterranean to spawn in the Spring; the fishermen use a complex and gradually converging series of nets to corral their prey. Sample the results at El Campero (956 432300, restauranteelcampero.es ), an unprepossessing restaurant of considerable regional fame and popularity. If you´re happy to turn up and hover for a table, the informal tapas bar at the front is both more affordable and more fun than the stiffer dining room. As well as the main Bluefin dishes (from £15.20), you can feast on endless variations of tuna, including kebabs, sashimi, stews and even a cute mini burger (tapas from £2.60, mains from £12). Head west, in the direction of Portugal, and you´ll run into the sherry-producing triangle of Jerez de la Frontera, Sanlucar de Barrameda and El Puerto de Santa María. For a snifter, I´d choose Gutierrez Colosia (956 852852, gutierrezcolosia.com); a friendly, family bodega in the heart of El Puerto de Santa Maria – a charming town with more character than Jerez. While you are there, you may, as well do some more eating. El Faro (956 87 0952, elfarodelpuerto.com; mains from £14) is acclaimed for its warm ambience and traditional Spanish cooking. But the town is also home to the most exciting and original restaurant in Cadiz province, if not beyond – A Poniente 956 851870, aponiente.com ). In this small, contemporary space, tucked away on a side street, Angel Leon and his team conjure up all manner of inventive piscatorial delights – sea-urchin burrata, shrimp tempura with plankton wasabi and more. It´s an unusual and thrilling gastro experience, expertly marched through by numerous sherry wines; the tasting menu costs £98. If you need an excuse to go, then you´ll be doing your bit to support the under-pressure sherry industry – and aiding the bailout of the Spanish economy – by eating and drinking extensively on the Costa de la Luz. Your prospects of returning from the Coast of Light any lighter, however, are somewhat remote. Getting there: fly to Jerez with Ryanair, or to Gibraltar, 50 miles away, with Monarch, easyJet or Ryanair. Where to stay: the romantic La Casa del Califa ( 956 447730, lacasadelcalifa.com; doubles from 68, B&B ) is a Vejer stalwart, with individually styled rooms and a knockout rooftop bar. The chic and sleek Hotel V ( 956 451757, hotelv-vejer.com; double from 130 ) offers a stylish, more contemporary experience. Further West in El Puerto de Santa Maria, try the Hotel Monasterio de San Miguel ( 956 540440, hotelmonasteriodesanmiguel.es; doubles from 54 ). ← Vejer en la tele!